What a journey it has been already. 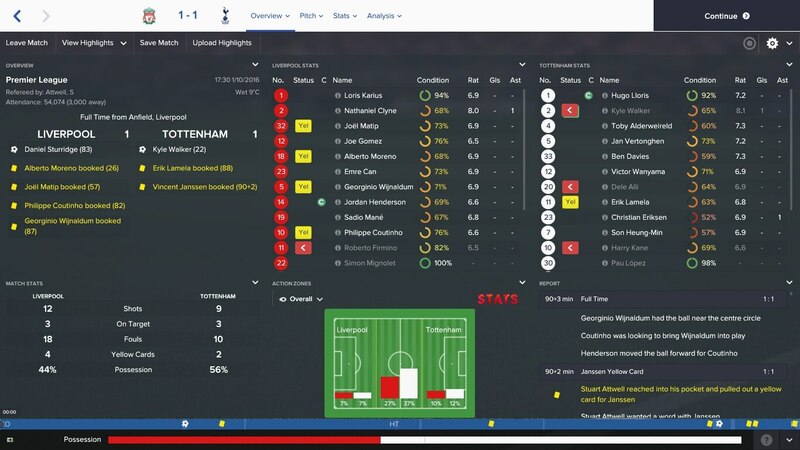 My first month as Liverpool manager was one to be forgotten as we lost all four of our fixtures. But the lads were able to bounce back in September, picking up three wins from three and not conceding a goal. October is a tough month for us as we have a tricky home game against Tottenham and of course the Merseyside derby at Goodison Park. Our performances in September should give us confidence going into these games, and as long as we can avoid injuries, we should be okay. 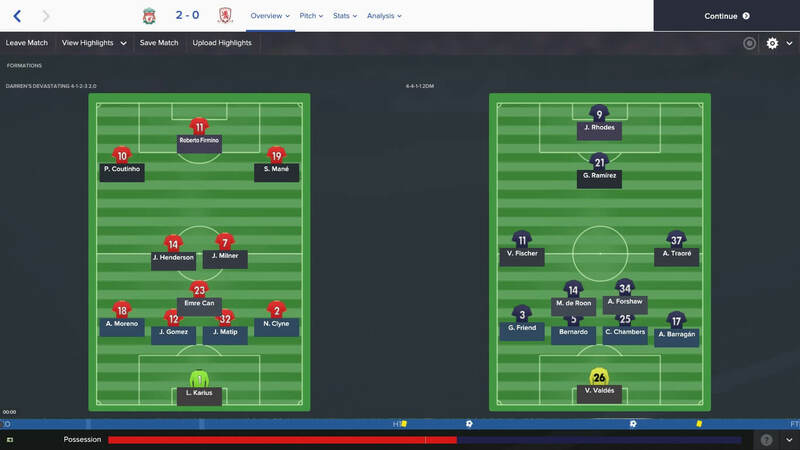 Once again, I am sticking with my 4-3-3 tactic as it finally paid off in the last episode. Bringing Joe Gomez into the back four was a good move, and I have changed Jordan Henderson’s role to box-to-box midfielder as it is better suited to his attributes. Up front, I have decided to give Daniel Sturridge a chance following his return to fitness. First game in this episode is against Tottenham, who are probably going to be challenging for a top-four place at the end of the season so a result here could be massive. Roberto Firmino will lead the line, but Sturridge is back to 100% and will be a good option off the bench. Alberto Moreno returns following his suspension. After a poor start against Mauricio Pochettino’s men, I am pleased with Sturridge’s late equaliser, and I’ll take a point. Kyle Walker burst past Gomez for the opener after Moreno was caught out of position, but Loris Karius could have done better. I grilled the side at half-time, and it clearly worked as the lads responded with a better second half performance which resulted in the equaliser. Another home game is next as we welcome Middlesbrough to Anfield. ‘Boro are short of confidence coming into this one so three points should be a certainty. I have opted to keep Firmino up top but will use Sturridge if need be. 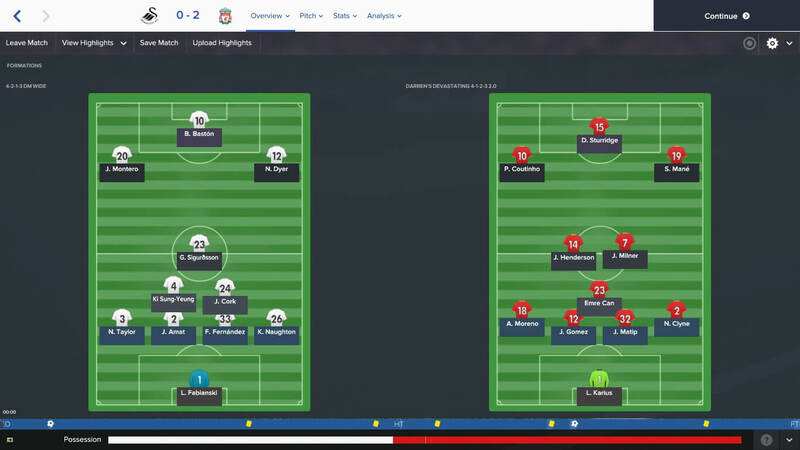 An injury to Adam Lallana means I have brought James Milner into the starting eleven. A solid result against a struggling side. Again, Firmino did not impress me while Sturridge scored from the bench meaning he might have earned a starting berth for the next few fixtures. We peppered the goal for the first-half, but the breakthrough did not come until the 54th minute when Milner hit one from distance. 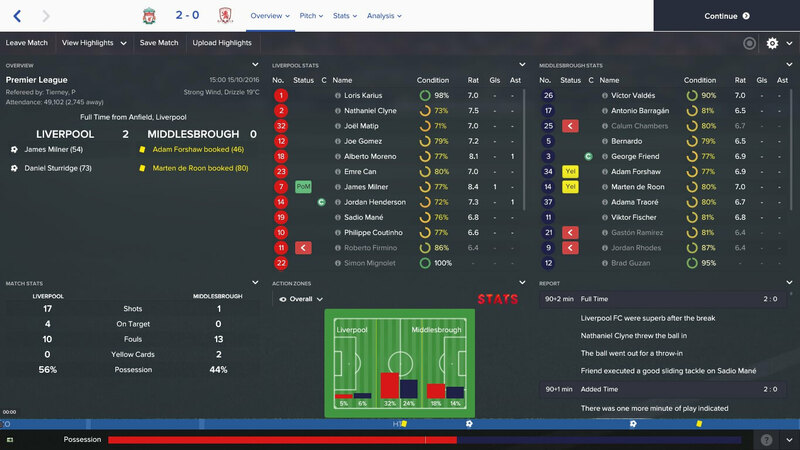 A tap in from Sturridge sealed a routine victory with ‘Boro registering just one shot all game. A trip to Swansea is the first of two away games in this episode. Bob Bradley is still in charge of the Swans but faces an uphill battle to keep his job following a rough start to the season. My press conference was full of questions about the American, and I added more pressure onto my opposition’s shoulders by stating it could be his last game if they lose. Sturridge replaced Firmino in the only change from the Middlesbrough win. Another good win and another clean sheet. Philippe Coutinho got us off to the best possible start in the sixth minute and eased the pressure against a heavily defensive side. After giving Sturridge the nod, he decided to have his worst performance of the season and was replaced by Firmino, who scored, obviously. Ben Woodburn made his debut and grabbed the assist for the Brazilian’s goal after I took Sadio Mane off with eyes on the Everton fixture. The biggest game of my short career, the Merseyside derby. Everton are currently above me in the table, but a win would see me leapfrog them in the standings. Ronald Koeman had some nice words to say about me in the press conference, but I was fully focused on a win. Romelu Lukaku is in great form and will cause me problems. I gave Firmino the start and opted keep Sturridge as a super sub. What a game! Not the best of results but I will take a point at Goodison Park and wait for the Blues to come to Anfield to give them a beating. I knew Lukaku would cause me problems, but it took just seven minutes for him to score with Everton’s first shot. Mane equalised with a fantastic volley, his first the club, but Gerard Deulofeu put Everton back in front. 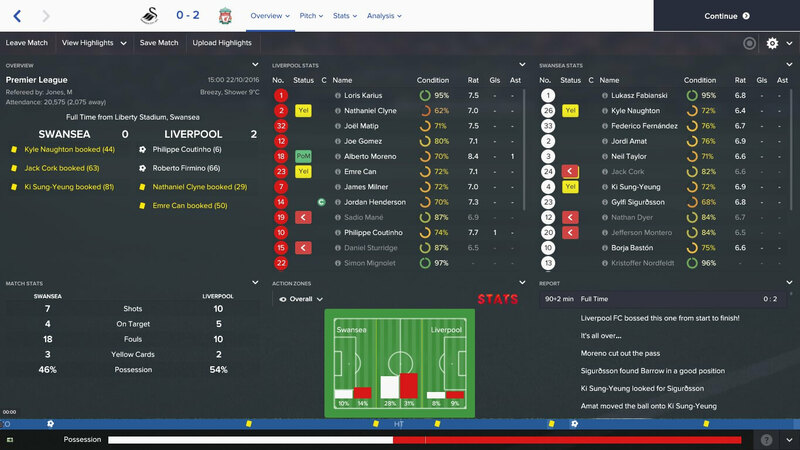 I introduced Sturridge at half-time to devastating effect. The ball had bounced over Bryan Oviedo before the Englishman banged one from 25 yards. Back level, I was happy with a point before Ross Barkley scored Everton’s third with their third shot of the game. Typical. However, there was more late drama, Sturridge was fouled in the box and stepped up, kept his nerve and slotted the penalty. Another unbeaten month and one I am very pleased with. Tottenham was always going to be a tricky fixture and Goodison Park is no easy place to go and play. Routine victories against Middlesbrough and Swansea round off a solid month’s work for the boys. Losing Lallana was a big blow, but Milner was solid in his absence. I am concerned by our lack of squad depth and may look to the free agent market for some cover – Martin Caceres could be an option.